Apple's never seemed very interested in the processor race. While Android phones are packing in quad-core chips and even starting to look at octa-core ones, Apple has long stuck with a dual-core processor and according to the latest rumours that's not going to change. Chinese site cnBeta.com reports that Apple's new A8 processor, which we're expecting to see in the iPhone 6, will once again be dual-core, but while the current A7 chip is clocked at 1.3GHz, the A8 will apparently be 2GHz or more. Apple's hardware has never felt lacking in power but a speed increase that big could give it a noticeable boost, though other reports suggest that Apple is focussing more on efficiency and battery life than increased power, so it remains to be seen how much of a performance increase it will really lead to, if it's even true. 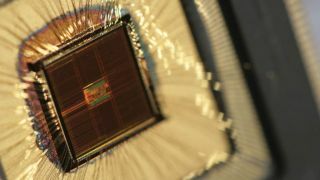 As well as being faster the new chip will apparently be manufactured using the 20nm process, making it smaller than the 28nm A7 chips. That in turn means that the electrons have less distance to travel, which should both improve its performance and save energy. It's also reported, unsurprisingly, that Apple will be sticking with 64-bit architecture. All in all though it sounds like a pretty big upgrade, especially when you consider that the last two iPhone models had 1.3GHz processors, so it's the first speed increase in a while. On paper this will still leave it trailing behind Android and Windows Phone, but what the iPhone lacks in raw power it's always seemed to make up for in its marriage of hardware and software. We may have got our first look at a finished iPhone 6.